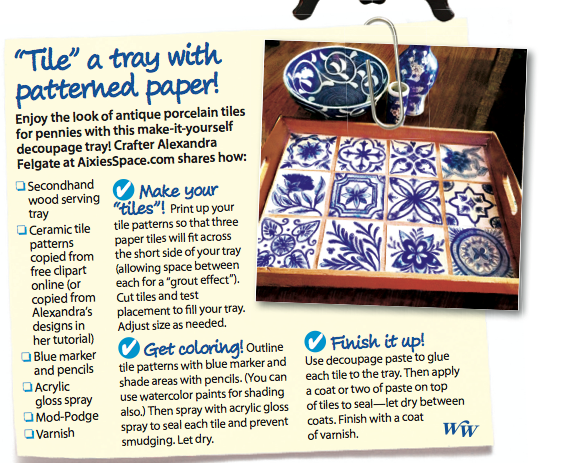 My Tile Tray : Featured in Woman’s World Magazine! I’m so very excited, because my blog has been featured in the latest issue of Woman’s World Magazine !!! They have featured my upcycled blue and white tray post from May 2015, how cool is that? This entry was posted in Craft Projects, Decorating, Home DIY and Decor, Op Shopping, Upcycled Projects and tagged blue and white, decoupage, diy, feature, magazine, tile, tray. Bookmark the permalink. 2 Responses to My Tile Tray : Featured in Woman’s World Magazine!